Upon hearing that call, Kevin Costner’s character in “Field of Dreams” is inspired to construct a new baseball diamond on his land – because if he builds it, players will show up. And they do. Upon building the field of dreams, ghosts of baseball greats magically arrive to play and recruit others. It’s a heartwarming story. But aside from being an intriguing Hollywood screenplay, it bears little resemblance to real life. In reality, Universal Studios spent approximately $15 million dollars to produce “Field of Dreams.” Keeping in line with standard practice, it probably doled out an additional $7.5 million to market the movie to ensure that audiences showed up in theaters. When calculating marketing budgets for movies, studios generally estimate about 50 percent of the production cost – because without marketing and distribution, well, you might just be wasting $15 million! If we look at content marketing programs through the lens of Hollywood movie production, then your content hub is your theater. You may be showing the most amazing movie ever produced, but if you don’t have a strategy for filling your theater, then your high-cost, high-production value content is going unseen and becoming wasted assets. Content marketing isn’t “Field of Dreams.” If you build it, they will not come. Every marketer needs to remember this. For this reason, digital distribution needs to be a critical component of every content marketing program. Investing in distribution can be heavy. It takes time and money to find, develop, and nurture an audience. But it’s also not that difficult. Here are some actionable ideas for how to think about content marketing and distribution as an inseparable pair that belongs in the same budget. Today, let’s focus on social media. Organic reach is dead. Long gone are the days when a brand or business could post something on social media and expect all their fans to see it, let alone engage with it. Now, organic reach is at an all-time low; through our work with brands, we’re now seeing it hovering around 1.5-2 percent across platforms. It’s safe to say that social media is a pay-to-play world. In addition, the amount of social sharing is essentially half of what it was in 2015, indicating that it’s a crowded, competitive world of content. So you not only need paid distribution; your content has to be unique enough to break through all the other blog posts, videos, infographics, and interactives vying for people’s attention. The good news is that social media targeting has improved significantly. Whether you’re going after a lookalike audience by geography or interest, or defining a completely new audience, stronger targeting abilities can help you distribute your content marketing to your desired niche. It’s important to remember that we’re coming in, uninvited, to our consumers’ worlds. We need to be the best party guest ever! We need to show up and ask questions and tell jokes before we ever start talking about ourselves or what we’re selling. We need to treat our customers like humans and actually get invited into their world to effectively nurture them as leads. At the end of the day, we’re using content marketing to drive business. But to do this, we need a robust content strategy that takes into account every step of the buyer journey. We need to define the furthest reaches of our brand’s storytelling and align it to what our audience cares about. This way, we’ll have relevant points for building relationships with consumers, no matter where they are in their journeys. For example, if we’re a beauty brand and all we really want to say is, “Buy our lipstick!” what’s a story one step out from that? Perhaps it’s: “Experimenting with makeup is so much fun!” And what’s a story even further away from our core product message? Maybe it’s, “You are unique and therefore beautiful.” We should be making content against all three pillars. Our goal is to grab the attention of the people furthest away from purchase and nurture them from “You are unique and therefore beautiful” content to “Buy our lipstick!” content. 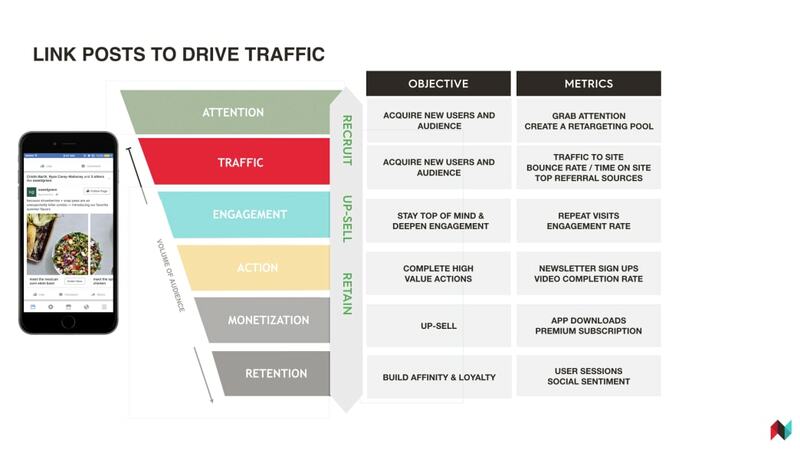 Lastly, redefine your content marketing funnel. How you would approach a product launch using television and print is not the same as how you would approach a product launch on social media. Remember, when we show up, we can’t just start talking about our product. We need to nurture our audience to a place where they are ready for product content. Everything we create has to have a consumer-first lens on it, especially when we’re vying for attention on Instagram with friends, family, dog photos, other brands, crushes, and Stories. Where, exactly, is your audience? What social media channels are they on? These are all important questions to ask ourselves before we show up to the party. Begin by looking at statistics to find out if your target is on the platform. Dig into reports and studies. Look at the audience targeting features on each platform. For example, try Facebook Audience Insights to figure out who your current Facebook audience is and where you can find your target audience. Once you’ve figured out where they are, determine what they’re doing on that platform. What do they like? With what content and brands do they engage? Who is best-in-class in and out of your category? Make sure you show up to the party ready to add value. Remember, we’re trying to be a good party guest. We should create a range of content that feels in line with our audience’s mindset. If we have content designed to strike up a conversation with our audience, other content to drive trust and consideration, and content designed to drive direct response, our distribution strategy should take the same approach. We need to distribute the right content to the right people at the right time. For example, if we’re targeting a new audience and we know they’re on LinkedIn, does it make sense to hit them immediately with a direct response product ad? No. Why? Because our audience is there to better themselves professionally, find work, or share content that makes them look smarter. And because they’re a new audience, they’re not familiar with us. How likely are they, really, to click on a bottom-of-funnel product ad? We’d be better off targeting them with a piece of editorial content that offers advice and thought leadership on how they can become more successful in their roles. Once you’ve aligned your story with your audience’s mindset and platform realities, make sure the paid formats you’re using also line up. For example, if you’re trying to promote brand awareness, make sure you’re using an awareness-driving format like an Instagram story or Facebook Canvas. If you’re trying to drive traffic, use a traffic driver like a Pinterest promoted pin. Looking for direct response? Try a lead generation ad on LinkedIn or an app download card on Twitter. Most social platforms have ad format guides to help you figure out how to match your business goals to actual ad formats. 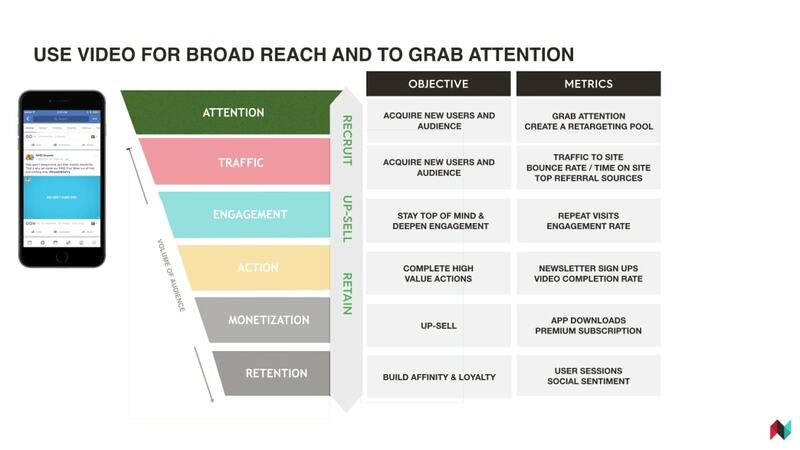 Taking a portfolio approach to distribution and promoting content across the funnel will help us figure out what our audience actually cares about. Much like building an integrated marketing strategy, it’s important to align distribution tactics with marketing objectives and, ultimately, business goals. Determine which KPIs you’ll track at each stage of the funnel and make sure they’re progressive and building upon the previous ones. 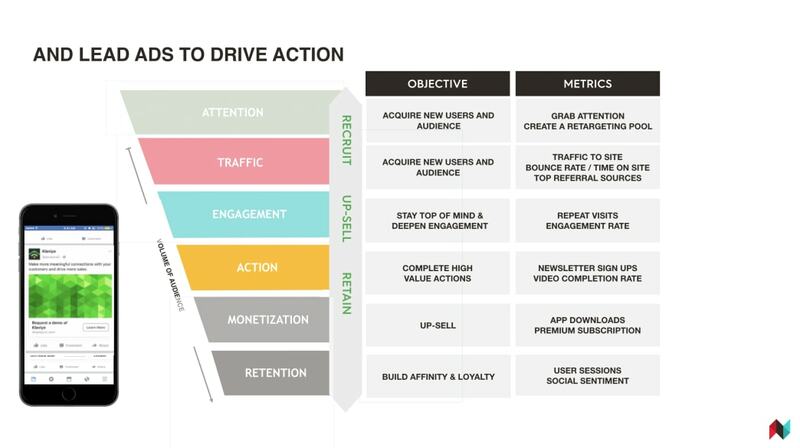 Review the analytics on a weekly basis (at a minimum) and determine how to optimize your strategy at each part of the funnel to prompt users toward action. Here’s one way to look at your funnel: In 2009, Comscore reported that only around 8 percent of people on the Internet account for 85 percent of all clicks on banner ads. In 2016, Facebook found a similar thing happening on its platform: The number of people who were actually engaging with content (with likes, clicks, shares, and comments) was extremely low, compared to the people aimlessly scrolling through their feeds. Through 500 brand studies, Facebook found that when people spent more time with a piece of content or ad on Facebook, the more likely they were to remember it. This resulted in an entirely new metric on the platform: estimated ad recall lift based on time spent with the ad. We use this example as a proxy, since Facebook is a behemoth and can directionally give us a better sense of what’s happening across the internet. With this reality, plus the rise of video, advertisers are looking to attention-grabbing metrics to build large cookie pools and create starting points for top-of-funnel leads. Grabbing attention and then retargeting or simply targeting with trust-building editorial content that drives to a hub can be an effective one-two punch to break through the noise and begin the process of getting invited into your customers’ worlds. Once a user has come to your content hub, you can target them with more relevant, high-quality content – lower funnel content – and optimize accordingly. Finally, once they’ve listened to your jokes and showed that they’re truly interestedby engaging with your content, it’s probably okay to bring up your product and drive them to convert. After all, you have been the best party guest, ever. Jennifer Stenger is NewsCred’s VP of Business Development. Lydia Cox is a NewsCred Program Director. Written by Lydia Cox and Jennifer Stenger for NewsCred. Featured image provided by NewsCred.